Keppel REIT announces its unaudited financial results for 1QFY2016 on 14th April 2016. Distributable income increased slightly by 0.8% despite the divestment of 77 King Street in Sydney in January 2016. DPU fell by 1.2% from 1.70 cents in 1QFY2015 to 1.68 cents in 1QFY2016. 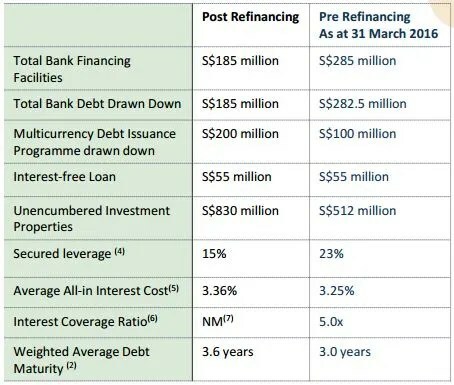 Keppel REIT has completed 100% of refinancing requirements in 2016. The weighted average term to maturity to 3.6 years. There is no refinancing requirements until the second half of 2017. 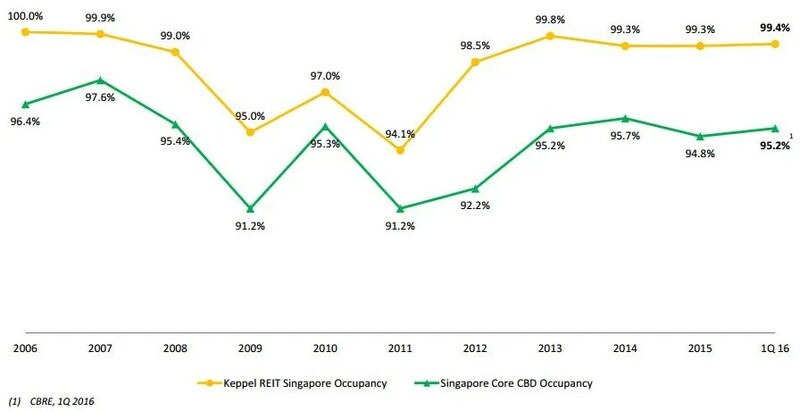 Keppel REIT achieved a significant reduction of expiring leases to only a minimal 3% for the rest of 2016, with a 99% tenant retention rate. 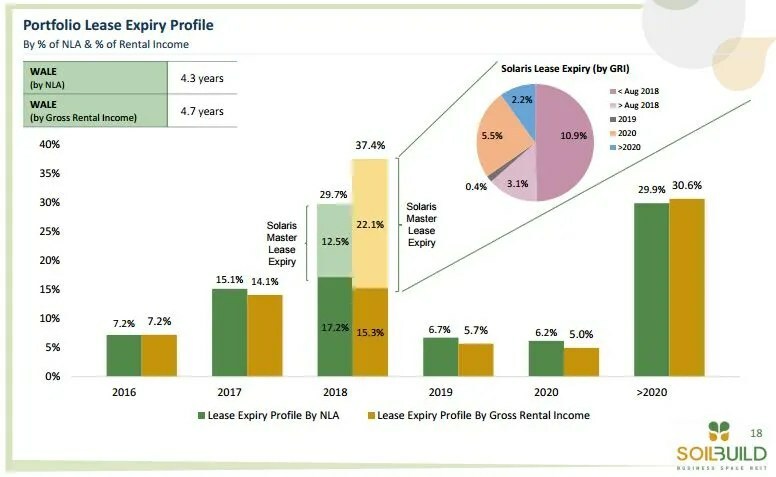 Long WALE of approximately 8 years (till year 2024) and 6 Years (till year 2022) for the top 10 tenants and overall portfolio respectively. Occupancy is 99.4% and an average positive rent reversion of 7% was achieved for all leases executed in 1QFY2016. not due for renewal till 2019 and beyond, when limited new office supply is expected. Average Grade A rent for Singapore’s core Central Business District is at approximately $9.90 psf in 1Q 2016. 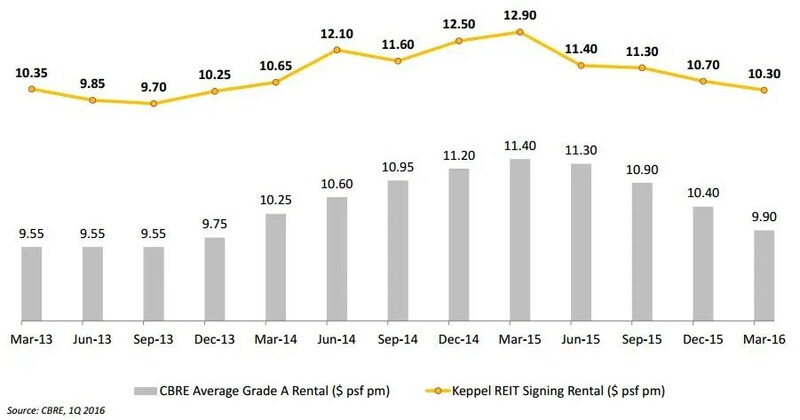 Keppel REIT is able to keep it at approximate S$10.90. Soilbuild REIT announces its results for 1QFY2016 on 21st January 2016. Gross revenue increased 8.2% to S$20.1 million and net property income (“NPI”) grew 8.8% to S$17.2 million. Distributable income rose 9.6% to S$14.6 million from S$13.3 million in 1QFY2015. Distribution Per Unit (DPU) fell 4.7% to 1.557 cents as compared to 1.633 cents a year ago. The annualised distribution yield is 8.5% based on the closing price of S$0.73 as at 31st March 2016. With the post refinancing in April 2016, the weighted average debt maturity was lengthen from 3 years to 3.6 years. Soilbuild REIT has a portfolio occupancy rate of 94.8% as at 31 March 2016. The portfolio renewals achieved a positive rental uplift of 7.6%. Weighted average lease expiry (by gross rental income) stands at 4.7 years.